You want success, but then something inside of you does not want success… .Fear of success comes up when you try something new and most of the time, this fear prevents you from doing the things you love to do. Have you noticed this conflict inside of you? A weird feeling of unease in my belly, or solar plexus. A "voice" inside of my head saying: oh you don´t really want to do this, it´s too scary, what if it goes wrong, it takes too much energy, people will not like it, you are too old, you don´t really want this anyway. And on it goes…The strange thing is, this might be the very thing you want in life: to be successful with something you love to do, but the "voice" does not want to help you do it. The "voice" wants to keep you safe. No goals get achieved, just the same old, safe, unfulfilling life. What can you do? 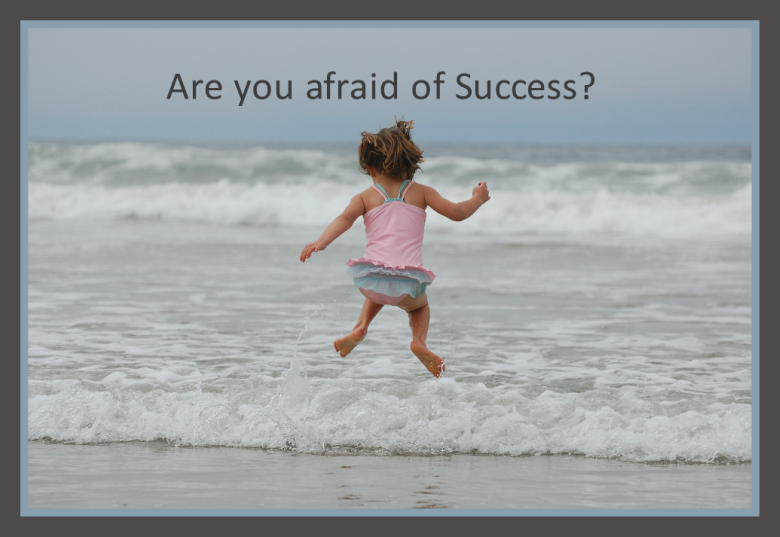 You can face the fear…and you can try these 4 simple tips to help you act in spite the fear of success. Awareness is the first step. Just by being aware of your voice and the feelings in your body, you can feel the fear and chose to act anyway. It will not feel good the first time, but the more you do it the easier it will be. Simple example: When I started with social media and online marketing 2009, I wanted to post a tweet on Twitter. I was scared to death, somehow I thought everybody on Twitter will look at this and think, oh what a stupid thing to say….But eventually I overcame the fear and posted the tweet….now it´s routine. I had the same fear with writing articles, creating and posting videos, doing interviews, approaching new people. To be honest, anything outside of the routine is still difficult, but now I have ways to help me over the resistance. After being aware, it´s helpful to visualize what you want and create little reminders of your dreams and goals. For example a visionboard is a great tool to remind you of what you really want in life, it´s also fun to create one. I will post some videos about: How to create a visionboard, at the end of the post. Create a mastermind group: 3 to 5 people in your inner circle who know about your dreams and goals and will remind you. Make sure they are people who want to help you to succeed and believe in you. It´s a good idea to talk to them about your resistance and fear of success, so they are fully aware of it and can help you through. There is no easy way… the fact is there is fear and it does not feel good, but the only way out is through. Create a list of affirmations and simple sentences that will remind you of what you want to achieve, write them on little cards, set reminders on your phone, on the wall, on the bathroom mirror, in your purse. It sounds a little simple minded, but these simple affirmations help. If you need more help, get a coach! Someone who will help you through the walls of resistance. Someone who recognizes your full potential and knows how to help you realize it. And last not least, just have fun with the process, enjoy it! Enjoy even the difficult parts! Yes you can!!! Please leave a comment if you would like to share your ideas, if you like this post, or even if you don´t like this post. 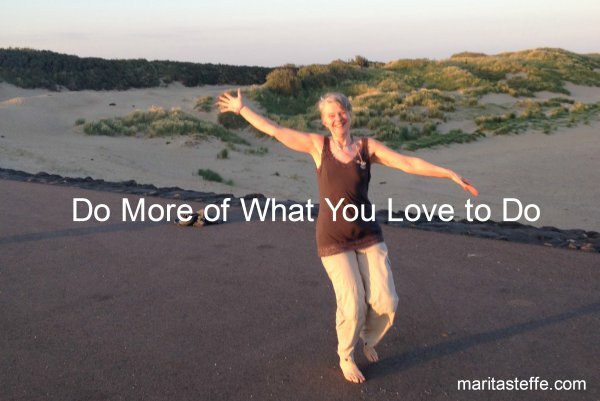 Author MaritaPosted on July 13, 2016 July 14, 2016 Categories Empowerment, Inspiring storiesTags act inspite of fear, do what you love, empowerment coaching, fear of success, get a coach, life coaching, move through resistanceLeave a comment on Fear of Success? But you just never know what miracles can happen. Now I'm thinking about writing a book to share my eventful life experiences, a journey from enduring life to loving life. We'll see when that happens….Right now I am fascinated by Human Design and I learned that one of my "superpowers" is to share my experiences. Wouldn't it be great to share this in a book? The more you do the things you love to do, the more the things you love will come to you. Meditative dancing is another great way to express yourself. It's not recreational dancing, but a form of moving meditation, which I discovered through a good friend of mine in California. It's called "5 rythm dancing" or "sweat your prayers". Click the link if you would like to find a class in your area, they normally let you try one for free and after that it's $15 per class. Dancing meditation is: to be moved by the music. The body is the instrument that is being moved, it's a way to get into the body out the mind, to free yourself from thinking, planning, strategizing, future tripping and worrying for a short time. Sometimes when I dance, solutions to problems float into my mind, or I get flashes of creative ideas. Moving meditation is also self expression at it's finest, it's not about looking good, it's not about taking the right steps, it's not about performing…..It's about "the expression of self" expression of spirit, a prayer in motion…..and also a way to deeply connect with others. Ok, this might sound a bit too much for the people who are "rational" and don't believe in spiritual practices and believes… By the way this could have been me ten years ago, I was very rational and did not understand the "new age thing, the old hippie thing, the "god thing"….But I changed my mind. I now live in a mind-space of miracles, when I say miracles…it's the little things in life where the timing is just right. Someone or something appears out of the blue and it helps, inspires or motivates me. Maybe it's the next piece in the puzzle of my life. For example, I was at a friends house and I had the thought; Marita… walk to the creek… somehow I did not do it….another hour later I had the thought again….Marita walk to the creek. This time I put my shoes on and walked to the creek. If I would have come 2 minutes later or one minute earlier… we would not have met on this path… this is what I call "my little miracles." I don't know, why we met, but I know the timing was so crazy that there must be a good reason. Maybe I can say something to him, that he needs to hear to open something up for the next step on the journey, maybe it's something I will need to hear……Who knows? Now… you might ask; what's the common denominator between miracles and doing what you love to do. Well for me it works together, the more I do the things I love to do and I can generate the energy of inspiration, the more I experience these kinds of miracles. I think it's heightened awareness and being in tune with my intuition. Simple Miracles happen all the time, but the question is: are you aware of them? Make a little experiment and try it for yourself…… Now back to dancing, tonight I will actually go visit a club with disco music, it's not the same spiritual experience, but it's super, fun exercise for me. I remember that 10 years ago it would have been in agony to think about going to a club alone, just dancing and having a blast. These days I can do it… no problem and I totally enjoy myself. Doing more of the things I love to do, is changing my life. The energy of blissful enjoyment is attracting more things that I love into my life. Yeah, that's how the Law of attraction works in my life….